Blue Colored Contact Lenses Emulate The Appearance Of Your Iris Let your presence sparkle through and rule the party with striking eyes. Create an impressive look with an exclusive range of colored contact lenses. Your iris is contained patterns, shapes, and speckles so most colored contact lenses enhance these unique features. 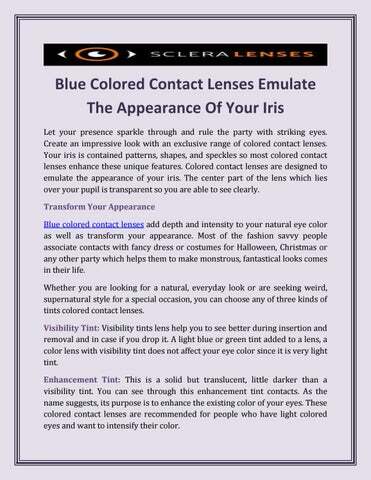 Colored contact lenses are designed to emulate the appearance of your iris. The center part of the lens which lies over your pupil is transparent so you are able to see clearly. Transform Your Appearance Blue colored contact lenses add depth and intensity to your natural eye color as well as transform your appearance. Most of the fashion savvy people associate contacts with fancy dress or costumes for Halloween, Christmas or any other party which helps them to make monstrous, fantastical looks comes in their life. Whether you are looking for a natural, everyday look or are seeking weird, supernatural style for a special occasion, you can choose any of three kinds of tints colored contact lenses. Visibility Tint: Visibility tints lens help you to see better during insertion and removal and in case if you drop it. A light blue or green tint added to a lens, a color lens with visibility tint does not affect your eye color since it is very light tint. Enhancement Tint: This is a solid but translucent, little darker than a visibility tint. You can see through this enhancement tint contacts. As the name suggests, its purpose is to enhance the existing color of your eyes. These colored contact lenses are recommended for people who have light colored eyes and want to intensify their color. Opaque Tint: These lenses are deeper, non-transparent tint that can alter the color of your eyes. They come in a variety of solid colors patterns including green, violet, brown, grey and hazel. If you have dark eyes, you can change your eye color completely. How To Choose Your Colored Contact Lenses Once you know the kind of contact lenses you need then you should figure out what shade is going to give stunning looks to your eyes. But in case, if you are looking for a complete transformation then you need not worry about which color will suit your natural look. For Light Shade Eyes If your eyes are of light shades and you want to add more depth without making a big change. 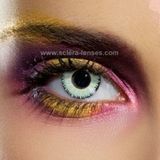 Consider your skin tone and hair color enhancement tinted colored contact lenses add fine shades to your eye color. For the pale blue eyes, you should try for blues, greys and even shades of green for a soft and more understated change. For a bold statement, according to your contrast look out for opaque lenses in chocolate brown 3 tone contact lenses that contrast with your blonde hair and fair skin. For Dark Shades Eyes You can use opaque tinted lenses in light shades of brown to soften the impact of your dark brown eyes. You should look for fresh look colors as they come in vibrant and exciting shades, gives you a striking appearance or eye-catching looks. Colored contact lenses should be disinfected and stored in appropriate contact lens care case.